The experimental method of introducing foreign mole­cules into cells is an important tool to facilitate studies in various biological fields. Transfection using lipophilic methods (liposomes or other cationic species) is a convenient means of introducing many different types of molecules (plasmid DNA, RNA, siRNA, and miRNA) into eukaryotic cells [1,2]. However, the optimal condition for incorporation depends on the type of transfection reagent and the cells being used, resulting in variable transfection efficiency and the extent of cell damage caused by transfection. It would be desirable to use a single transfection reagent in different types of experiments (e.g., gene over-expression, gene knock-down, and live cell imaging), since it increases the cost/performance ratio of each experiment and enables discussing data without considering the side-effects of each transfection reagent. In this study, we determined the optimal condition of transfection using FuGENE® HD Transfection Reagent for transient gene expression and siRNA knock-down experiments. Using the same reagent, we also performed live cell imaging of inositol trisphosphate (IP3) dynamics after transfection with our original fluorescence resonance energy transfer (FRET)-based IP3 sensor IRIS-1 . Our data indicated that FuGENE® HD Transfection Reagent is a powerful transfection reagent having high transfection efficiency without cell damage which can be applied to different types of experiments. Anti-GFP antibody and anti-80K-H antibody were purchased from Santa Cruz Biotechnology Inc. Anti-ß actin antibody was purchased from Sigma Aldrich. The anti-inositol trisphosphate receptor 3 (IP3R3) antibody was KM1082 . COS-7 cells (a monkey kidney cell line) and HeLa cells (a human cervix cell line) were obtained from RIKEN Cell Bank. COS-7 cells and HeLa cells were cultured in Dulbecco’s modified essential medium (DMEM; Nakarai Tesque) supplemented with 10% fetal bovine serum, 50 units/ml penicillin, and streptomycin (Nakarai Tesque). COS-7 and HeLa cells (1x 105 cells) were plated in a 35-mm tissue-culture dish with 2.0 ml of medium (in some cases, on glass coverslips), which achieved the desired density of >60% confluency at the time of transfection. After 24 hours in culture, the culture medium was replaced with 2.0 ml of fresh medium. DNA was diluted with 100 µl of OptiMEM (Invitrogen Life Technologies). Then FuGENE® HD Transfection Reagent (2 µl, 4 µl, or 8 µl) was added directly into the OptiMEM/DNA mixture and mixed well by vigorously tapping. After incubation for 15 minutes at room temperature (RT) for complex formation, the mixture was added to the cells drop-wise. Ratios of DNA to FuGENE® HD Transfection Reagent used were 2:2, 2:4, and 2:8 (µg:µl) for the eGFP expression vector (pEGFP-C1, Clontech) and 1:2 for the IRIS-1 expression vector . As a reference, the EGFP expression vector was transfected with transfection reagent T according to the manufacturer’s protocol. COS-7 cells (1x 105 cells) were plated in a 35-mm tissue-culture dish with 2.0 ml of culture medium. After 24 hours, culture medium was replaced with fresh medium. Short interfering RNA (20 µM, Stealth siRNA, Invitrogen) was diluted with 100 µl of OptiMEM. FuGENE® HD Transfection Reagent (2 µl, 4 µl , 6 µl, or 8 µl) was added directly to the OptiMEM /RNA mixture and mixed well by vigorously tapping. The mixture was incubated for 15 minutes at RT, and the transfection complex was added to the cells drop-wise. As a control experiment, Stealth siRNA was transfected by transfection reagent L according to the manufacturer’s protocol. Proteins were separated by 7.5% SDS-PAGE and transferred to a polyvinylidene difluoride membrane. The membranes were blocked with 5.0% skim milk in PBS containing 0.05% Tween-20 (PBST) for 1 hour and probed with the primary antibody for 1 hour at RT. After washing with PBST, the membranes were incubated with an appropriate HRP-conjugated secondary antibody and signals were detected with Immobilon Western Detection Reagents (Millipore). Transfected COS-7 and HeLa cells grown on glass coverslips were washed once with PBS, fixed with 4% formaldehyde in PBS for 10 minutes, permeabilized by 0.2% Triton X-100 in PBS for 5 minutes, and blocked with 1.0% skim milk in PBS for 60 minutes at RT. The cells were then stained with a mouse anti-GFP antibody (1 µg/ml) or a rabbit anti-80K-H antibody (2 µg/ml) for 60 minutes at RT. Following three washes with PBS for 15 min in total, Alexa 488-conjugated goat anti-rabbit IgG (Molecular Probes) or Alexa 488-conjugated goat anti-mouse IgG (Molecular Probes) were applied for 60 minutes at RT. After washing with PBS, the coverslips were mounted with Vectashield containing DAPI (Vector Laboratories) and observed under BZ-8000 fluorescence microscopy (Keyence) with a 20x objective lens. IRIS-1 cDNAs inserted in pcDNA3.1 zeo(+) were transfected into COS-7 cells with FuGENE® HD Transfection Reagent. After 24 hours, cells were used for imaging. Imaging was performed under the constant flow (2 ml/min) of the balanced salt solution containing 20 mM Hepes, pH 7.4, 115 mM NaCl, 5.4 mM KCl, 1 mM MgCl2, 2 mM CaCl2, and 10 mM glucose as an imaging medium at 37°C. Imaging was performed through an inverted microscope (IX-71, Olympus) with a cooled charge-coupled device camera (ORCA-ER, Hamamatsu Photonics), a 40x (NA 1.35) objective lens and a light source exchanger (DG-4, Sutter Instrument Co.). Excitation of IRIS-1 was performed by using a 450-nm dichroic mirror and a 425- to 445-nm excitation filter. Fluorescence emission from IRIS-1 was split by an emission splitter (W-view, Hamamatsu Photonics) equipped with a 460- to 490-nm filter (cyan), a long-path 520-nm barrier filter (yellow), and two 505-nm dichroic mirrors. Images were acquired at 0.25 Hz, with an exposure time of 100 ms. Acquisition and off-line analysis were performed with MetaFluor software (Molecular Devices Co.). To optimize the conditions for the transient gene expression in COS-7 and HeLa cells using FuGENE® HD Transfection Reagent, we transfected the cells with different ratios of DNA (encoding EGFP): FuGENE® HD Transfection Reagent complex [2:2, 2:4, and 2:8 (µg:µl)] and evaluated the transfection efficiency after 24 hours. As shown in Table 1 and Figure 1a, the transfection efficiency of EGFP in COS-7 cells was increased in a FuGENE® HD Transfection Reagent concentration-dependent manner. In contrast, the transfection efficiency in HeLa cells was highest when 4 µl of FuGENE® HD Transfection Reagent and the 2 µg of the GFP-expressing plasmid were used (Figure 1b). Thus, we concluded that the optimal ratios of DNA to FuGENE® HD Transfection Reagent (µg:µl) were 1:4 and 1:2 for COS-7 cells and HeLa cells, respectively. To optimize conditions for the siRNA knock-down experiment using FuGENE® HD Transfection Reagent in COS-7 cells, we tried to down-regulate the expression of the protein kinase C substrate 80K-H (80K-H) as an experimental model. We used different ratios of stealth siRNA:FuGENE® HD Transfection Reagent, and carried out a similar experiment using another commercially available transfection reagent L for comparison. 48 hours after transfection, we examined the silencing efficiency of the 80K-H expression by western blotting and immunostaining. 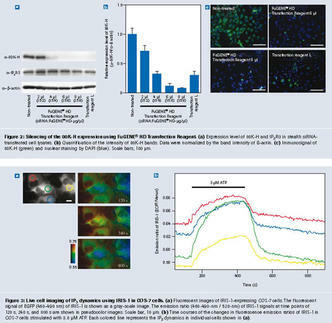 As shown in Figure 2a and 2b, the expression level of 80K-H was decreased by transfection with stealth siRNA-FuGENE® HD Transfection Reagent complex in a concentration-dependent manner. Immunofluorescent signals of 80K-H in the transfected cells using 6 µl and 8 µl of FuGENE® HD Transfection Reagent had almost disappeared as compared with non-transfected control cells (Figure 2c). The expression level of an unrelated gene, inositol trisphosphate receptor 3 (IP3R3), was not changed, indicating the specificity of the action of stealth siRNA (Figure 2a). Based on the results, we concluded that the recommended ratio of FuGENE® HD Transfection Reagent to stealth siRNA was 1.5:8 (µg:µl) for siRNA knock-down approaches in COS-7 cells. Finally, we visualized IP3 dynamics in cells transfected with our original FRET-based IP3 sensor IRIS-1 . Since cell damage by transfection reagents was more critical in live cell imaging, we reduced the volume of transfection reagents as low as possible while keeping sufficient transfection efficiency for live cell imaging. 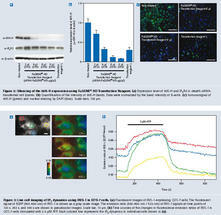 Thus, we selected the 1:2 ratio (DNA:FuGENE® HD Transfection Reagent, µg:µl) for IRIS-1 transfection. Under this condition, transfected COS-7 cells showed sufficient IRIS signals for imaging without any apparent abnormal morphology at the time of live imaging (Figure 3a). In additon, the transfected COS-7 cells showed a typical increase of the IRIS-1 fluorescent signal in response to the agonist stimulation (3.0 µM of ATP). Thus, we concluded that FuGENE® HD Transfection Reagent can introduce plasmid DNA into living cells without significant cell damage and is suitable for live cell imaging. In this study, we determined the optimal conditions for plasmid DNA and stealth siRNA transfection using FuGENE® HD Transfection Reagent in COS-7 and HeLa cells. Although Roche Applied Science also provides a transfection reagent specialized for siRNA transfection (X-tremeGENE® siRNA Transfection Reagent), we chose FuGENE HD® Transfection Reagent due to the very low toxicity reported for this reagent. Our data suggest that the optimal DNA:FuGENE® HD Transfection Reagent ratios (µg:µl) for efficient plasmid DNA transfection were 1:4 in COS-7 cells and 1:2 in HeLa cells. For siRNA transfection, the optimal ratio was 1.5:8 in COS-7 cells. We also found that FuGENE® HD Transfection Reagent introduced the plasmid DNA encoding IRIS-1 into COS-7 cells without affecting cell morphology, judging from live cell imaging of IP3. As a consequence, we conclude that the FuGENE® HD Transfection Reagent is an ideal transfection reagent applicable to various experiments yielding high transfection efficiency with minimal cell damage.